If you haven’t already seen it, I strongly suggest you read about the fascinating Hidden Mothers phenomena in Victorian photography, and its possible relationship to the tradition of post-mortem photography. Amsterdam-based fashion photographers/artists Anuschka Blommers and Niels Schumm have put a morbid contemporary twist on the history of this imagery, recycling the aesthetic conventions of hidden mother and post-mortem photography into a commercial kid’s wear fashion shoot. 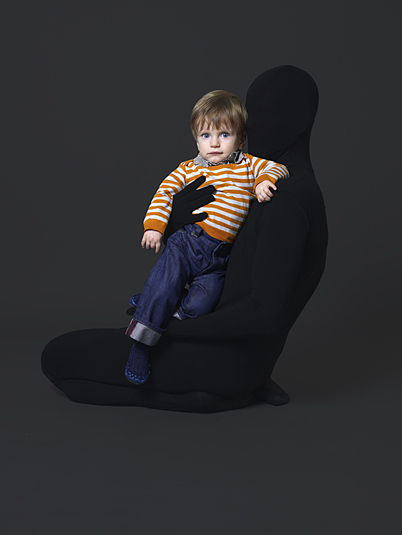 In the first part of Blommers and Schumm’s ‘Kidswear’ series, an anonymous figure clothed in a full black body suit holds the child against a dark backdrop. The children model clothing that is bright and spunky, at odds with the shadowy figure in the background. The dark figures are not themselves ominous: in fact, they usually seem to tenderly embrace the child as a mother would. But there is something undeniably unsettling about this act of hiding in plain sight, a feeling which also permeates the Victorian hidden mother photographs. Although I do think Blommers and Schumm probably approach this aesthetic with a sense of irony, the idea of referencing these visual tradition to sell kid’s clothing is pretty twisted. Their photographs are hauntingly beautiful, however, and they certainly capitalize on the morbid appeal of these photographs effectively. Do you see a conscious allusion to dead children in their work, or do you think their intentions were more innocent? 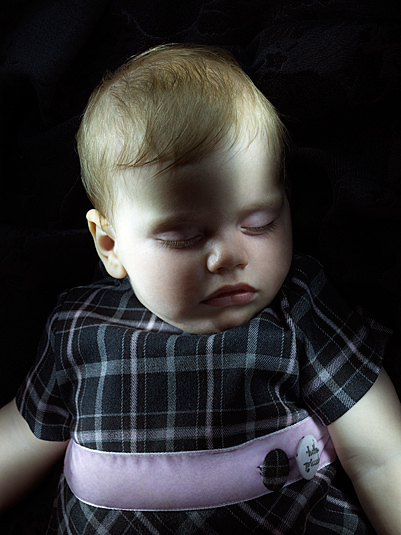 There are more images in their series, including a set where toddlers are either napping or playing dead in the grass; I encourage you to browse through their digital portfolio and decide for yourself. // Most images via the artists’ website, but the Victorian post-mortem photograph (on the right) from CVLT Nation, and the dual image fashion spread is from kid’s wear magazine. Original inspiration for this post via fette sans. More hidden mothers: post-mortem or not? The second series by Blommers and Shumm reminded me of children in the womb, The lighting on some adds a translucency, the colour in the cheeks, life. However each photo contains its own characteristics that have a slight echo of the past. The fact their wearing clothes could create political debate. Do you see a conscious allusion to dead children in their work, or do you think their intentions were more innocent? – Definitely conscious. Not innocent at all. Being familiar with both the types of Victorian photography you have discussed, I’d say the hidden mother pics are wonderful and evocative of the earlier genre but the “sleeping” babies is a totally creepy pastiche. Fascinating as art photos but poor taste in advertising. Eerie… but brilliant! 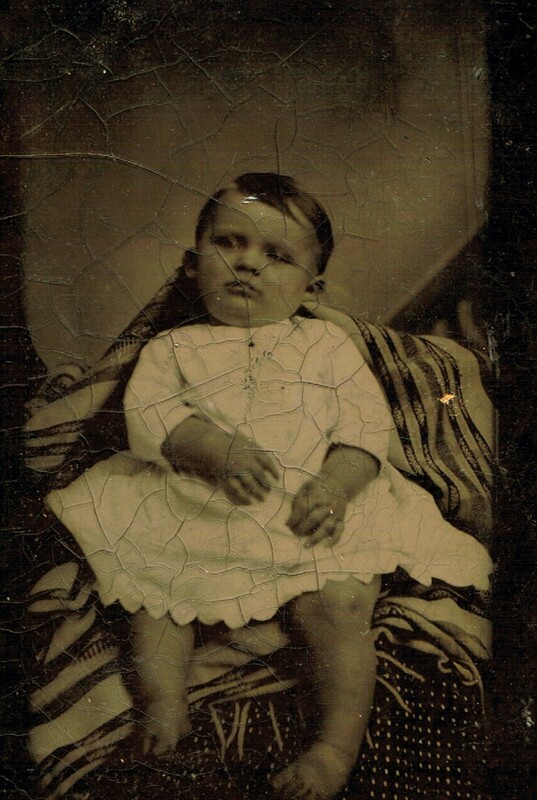 I saw the connection to Victorian post-mortem photos in the last three images. As soon as I saw the first picture I thought about those Victorian hidden mothers. I believe the photographers were fully aware of the connection. Unusual. I’ll have to think about it. Oh my! I am reminded of an Apple ad campaign meme when my daughter was an infant. We have a picture that is a darkened silhouette of her, holding the white iPod and with the white earbuds, all on a pink background. I wonder how that would fit into this scheme you have noticed? !